Andre Kikoski, who was brave enough to take on the challenge of designing a restaurant within Frank Lloyd Wright’s masterpiece museum, the Guggenheim, was just named the 2010 James Beard Foundation Award winner for Outstanding Restaurant Design. “As we seek to make architecture that is both innovative and inspired,we are delighted to receive this great honor from the James BeardFoundation,” Kikoski says. Despite the recession’s chilling effect on the restaurant industry, Kikoski had some fierce competition in the category: from Pie Lab, a space created by design-for-good collective Project M in Greensboro, Alabama, to Evan Douglas Studio’s work for Choice Market’s newest Dumbo location in Brooklyn. 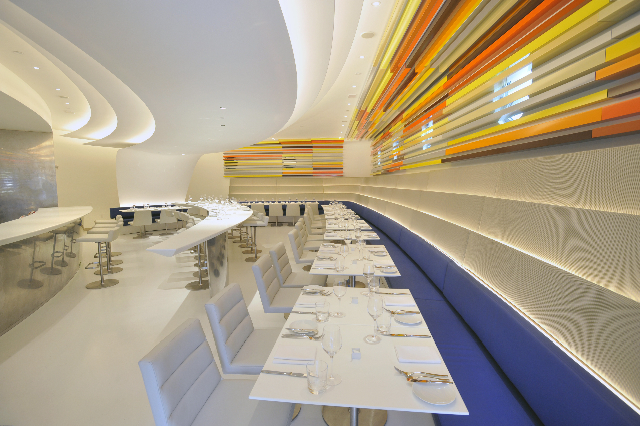 Design firm Pandiscio won the award for Best Restaurant Graphics for their work at the Standard Grill in New York.